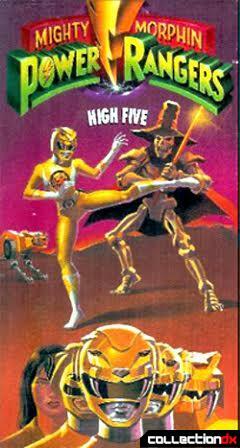 Bones is a monster from Power Rangers season 1 episode 2: High Five. In the Japanese version of the show his name is "Dora Skeleton" and he had no speaking lines. All he does is a creepy laugh which sounds very much like the ghost astronaut with the glowing helmet from that episode of Scooby-Doo. Bones is part of the 8-inch Evil Space Alien assortment of figures and has excellent detail on both the front and the back of his body. Things like the broken rib cage and the molded in spinal cord are a nice touch. Bones' face is very different from the show, which is a good thing. His shoulders swivel up and down with no problem, but his head barely turns (might be due to age) and he has the same issue with his waist. The articulation is there, but you have to force it a little bit. His cape can't be removed unless you pull his head off which I DON'T recommend. The cape seems to be made of some cheap plastic-like fabric. I would've preferred maybe satin or silk and the color should've been burgundy instead of that eye glaring pink, but that's just my opinion. He only comes with one accessory which is his sword. When not in use it can be stored in a holster on his side. It's a very small detail, but I'm glad it's there. Something I've noticed about the legs is the way they're positioned. You can move them but only outwards. Therefore standing him up is impossible unless you leave them the way they are.